On September 10, 1813 U.S. Navy Master Commandant Oliver Hazard Perry took advantage of a wind shift on Lake Erie to defeat a British squadron led by Commander Robert Heriot Barclay in the Battle of Put-in-Bay. Nearly two hundred years later, Bassmaster Elite Series pros are looking forward to another potential Lake Erie battle – this time for a chance to be crowned 2013 Bassmaster Angler of the Year. History lessons aside, nobody can predict who's going to be this year's AOY, but since the St. Lawrence River and Lake St. Clair represent the final stops on the 2013 Elite circuit, the Great Lakes are clearly at the center of the battle. But does this big water wrap-up to the Elite season give Great Lakes anglers the upper hand? Probably not, says Ken Duke, Senior Editor for B.A.S.S. Publications. Duke has been covering the Elite Series since its inception and points out that while experience on the Great Lakes is always valuable, it's not as likely to be a factor this year since the majority of the stops are either rivers or southern impoundments. "Skill on natural lakes may not come into play until the final two events", says Duke. The tour kicks off in March with back to back stops on Texas' Sabine River and Falcon Reservoir –challenging venues given the unfamiliarity of Sabine and the anticipated low water conditions at Falcon. After a layoff of nearly one month, the tour resumes in mid-April with a swing through the southeast including stops at Bull Shoals, West Point Lake and the Alabama River. The tour then swings northward with a late June stop on the Mississippi River in Lacrosse, Wisconsin before finishing with the two Great Lakes events in August. Kalamazoo Michigan Elite Series Angler Kevin VanDam lands another bass in his never ending quest to remain the best bass tournament angler in the world. But as Duke points out, anglers can't win the AOY title on the Great Lakes alone. To have a chance at the title, pros need to be in contention prior to those events and doing so requires tremendous consistency and versatility. One pro who understands the importance of being able to adapt to any type of water under any condition is Kalamazoo, Michigan native Kevin VanDam. VanDam's track record speaks for itself - four AOY titles and 23 straight Classic appearances. When VanDam looked at the 2013 schedule, he saw very diverse fisheries, each with different seasonal patterns. 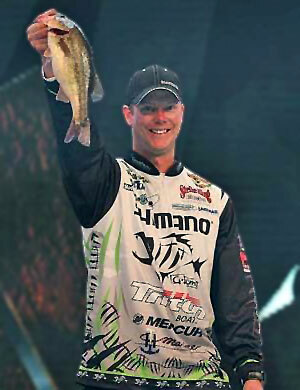 "I'm pretty excited about the 2013 season", said VanDam, adding that he especially looks forward to the challenge of new waters like the Sabine River. 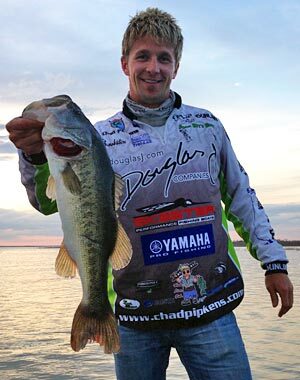 Jonathon VanDam shows off a largemouth bass during his first Bassmaster Classic appearance February 22, 2013 on Grand Lake. Photo Credit: B.A.S.S. By virtue of his win at last year's Bassmaster "mystery lake" event in Green Bay, Wisconsin, Jonathon VanDam rode his Great Lakes angling expertise all the way to a Classic berth. But it's his versatility and proven success on other fisheries that have kept him on the Elite Series. Holt Michigan Elite Series Angler Chad Pipkens hopes more bass like this Falcon Lake giant and finishing the 2013 season on home water will qualify him for his first Bassmaster Classic in 2014. First year Elite Series competitor, Chad Pipkens from Holt, Michigan hopes his experience on non-Great Lakes stops like Bull Shoals will complement his already extensive knowledge of the Great Lakes. Although winning AOY as a rookie is quite a reach, if Pipkens is within flipping distance of a 2014 Classic qualification heading into the final two events, you wouldn't want to bet against him. Count Newaygo, Michigan Elite Series angler Nate Wellman as one pro who doesn't buy into the idea that being from Michigan means you aren't adequately prepared for other Elite tour stops. "Michigan's diverse fisheries develop overall angling skills", says Wellman. While Great Lakes angling expertise doesn't ensure anglers of a chance at the AOY title, the timing of the two events means those in position to win will need to show they can master the big water. Or, as Duke says, "The last events are always the most interesting and important. If Kevin VanDam or some of the other Michiganders are in the hunt for AOY or a Classic spot at that point, you'd have to like their chances."